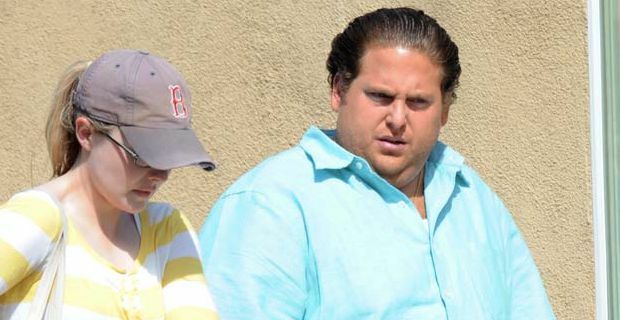 Movie star Jonah Hill has gained some serious weight and has been pictured on the set of his new film looking almost unrecognisable. After breaking on the Hollywood scene as a pretty big guy, Hill famously lost loads of weight and had a purple patch starring in films such as The Wolf of Wall Street and both Jump Street 21 and 22. Hill was looking bigger than ever on the set of crime-comedy caper Arms and the Dudes which is being directed by Todd Phillips of The Hangover fame. The film also stars and Miles Teller and is about two guys who win a $300 million contract from the US government to supply weapons to American allies operating in Afghanistan. The actor has attributed his previous impressive weight loss to enlisting the help of a nutritionist and eating plenty of Japanese food. Speaking about losing the weight he said "I just had a moment in my life where I said I wanted to become a man. And that means with my career, with my life, that means with my health." Hill has also insisted in the past that while he was slim he seemed to get more respect within the movie industry. He said "I think it's about the work you are doing. Getting in better shape is a sign of maturity. I think you are taken seriously." Although Hill has admitted to always struggling to maintain a constant weight, he has also managed to identify the main offender when it comes to gaining weight. In an interview from a couple of years ago, he pinpointed beer as his "achilles heel" saying "It’s so annoying because if I don’t drink beer I get really thin, and then when I drink beer I get a little bigger."